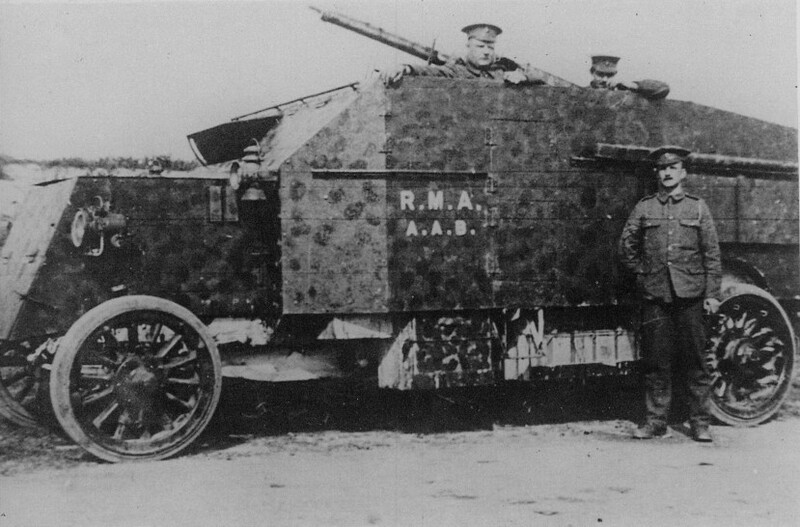 When, in the autumn of 1914, the Royal Marine Artillery (RMA) decided to create an anti-aircraft brigade, it had already choosen its weapon, the Vickers Naval 2-pdr automatic gun. It was better know as the “Pom-Pom”, a gun of WW1 and WW2 fame. To carry it, the choice was made to adopt the Pierce–Arrow 5-ton lorry chassis and give it a fully armored chassis. 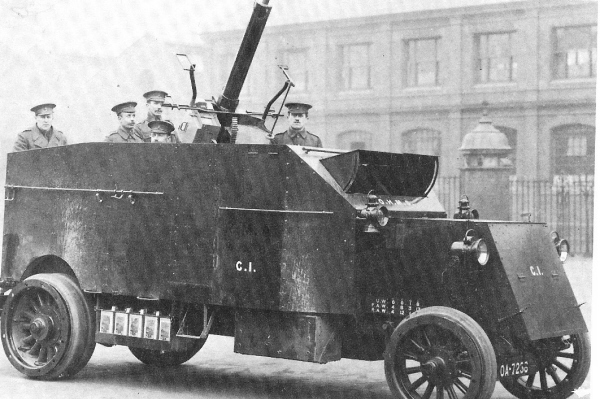 The Pierce-Arrow armored car was born, being the first British SPAAG. On 30 September 1914, the order was passed to Wolseley Motors Ltd, a subsidiary of Vickers. The chassis were imported from the USA. The vehicle had a 14-foot wheelbase (4.26 m) and was propelled by a 30 hp four-cylinder engine connected, through a shaft transmission, to the rear axle. Steering was done using the front axle. Each was given spoked artillery type rubber-tyre roadwheels with detachable rims. The front roadwheels were 36 in (91 cm) in diameter, while the double rear wheels were 40 in (104 cm). A bolted frame was assembled on the chassis, upon which were fixed the armored body plates, 5 mm thick (0.2 in). The next 16 received 7.5 mm (0.3 in) plates. 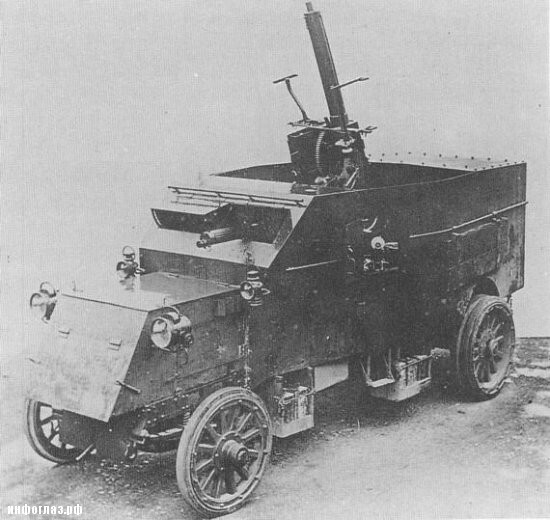 For close defense, the vehicle relied on a Maxim machine gun which could be mounted on pintles on either side, the rear doors, the front or through the co-driver armored shutter. The body was conventional, with a front engine protected by folded panels, a driving compartment with two separate armored shutters and the open rear compartment with room for the ammunition, extra storage on each side of the chassis, and access doors. The equipment was completed by handlebars on either side of the hull that were meant to help the crew climb in, two roadlights and two headlights at the front and two convoy lamps at the rear. The main armament was pretty impressive for a land vehicle. The 2-pounder (40 mm/1.57 in) could fire four rounds per second, and therefore several vehicles could put up a formidable barrage against any aircraft incursion at the time on a 3000 yards (2700 m) radius. With better ammunition in 1917, they were even found able to destroy high altitude bombers (cruising at 10,000 ft/3000 m), but with poor accuracy. Deliveries took place between March and June 1915, but because of a shortage of 2 pounders, only two batteries were equipped by the end of April and sent to France. The third one was created in August, but the brigade was not complete by September. However, spares for the gun and ammunition were in short supply in 1915. The Brigade shot down its first plane on 30 April 1915, only two days after introduction on the front, and over twenty more have been claimed before the unit was reequipped with longer range 3-inch AA guns during the Summer of 1917. In between, some were handed over to the RNAS (Royal Naval Air Service), and a single one joined the Locker-Lampson force in Russia. Their equivalent in Great Britain were the Seabrooke lorries, mostly used against Zeppelin raids. The Peerless (Wolseley) chain-driven were relatively similar to the Pierce-Arrow, but all were sold in 1916 to the Russian Government. Pierce Arrow with the RMA, 1915 or 1916, with a camouflage livery. 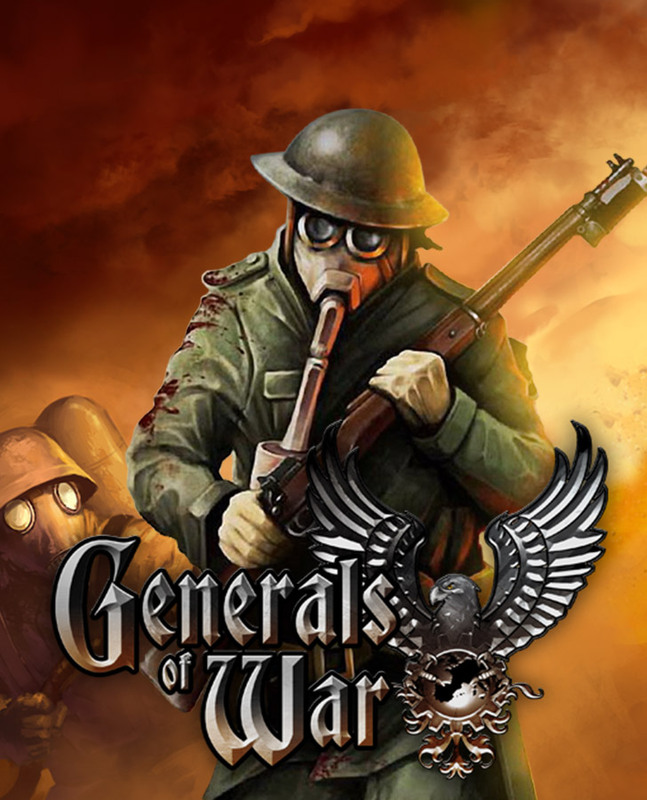 Isn’t this the Artillery Truck from Battlefield 1? It may very well be based on this vehicle. Interesting how Gabe thinks,like reverse engineering,the truck is from a game,rather then the fact the game has borrowed the truck from history,Pierce-Arrow could be claiming royalties in today’s litigation mad world.